Based on Nikken's award winning and best selling Multi-Lock milling chuck, the Nikken X-Treme solution retains market leading accuracy and the reliability that Nikken's customers expect from our Tooling solutions. X-Treme features a patented 'Sure-Lock' quad clamp system to provide positive locking & restraint of the tool shank even under the most extreme of cutting conditions when direct chucking. The X-Treme solution provides ultimate performance, control and reliability to meet the requirements of demanding Aerospace components and applications. 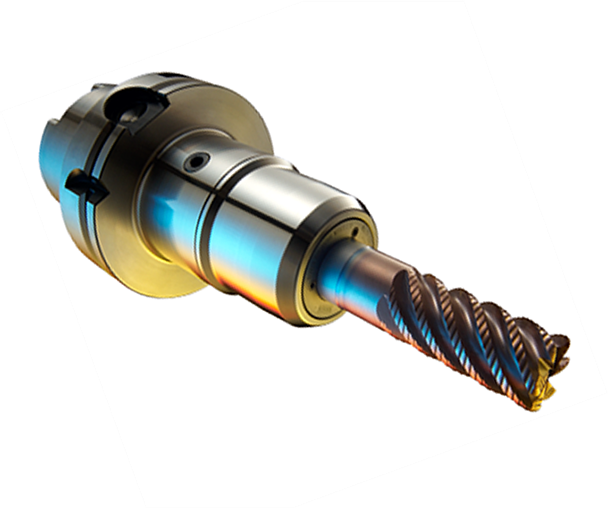 The X-Treme Chuck provides the largest gripping force available from any tool holder currently available in the market on NBT50 (dual contact), HSK and Polygon C8 spindles. As standard X-Treme is fitted with an exclusive patented positive shank location and integrated face sealing system. As an option the face sealing and shank location system are completely replaceable to provide additional capabilities for Nikken’s ‘Jetter’ system. Both options provide complete control and optimisation of high-pressure coolant systems to suit any requirement. Nikken Kosakusho developed the X-Treme for the demanding requirements of Aerospace Cutting Tools. During the testing phase the cutter and toolholder delivered 267 cm3/min when cutting Titanium at the Nuclear AMRC on a Starrag HEC1600. This impressive result would allow organisations to cut at over twice the normal depth associated with roughing & finishing Titanium. Imagine completing your roughing phase in half the current time! The X-Treme is the only product on the market that provides 100% concentricity and the stability required to maximise the potential of Aerospace Geometres. Delivering as much as four times the current tool life of competitor products & substantially reducing spindle loads during machining, this in turn delivers a substantial increase in the return on investment for those machining Titanium. Nikken X-TremeThe Nikken X-Treme solution in action removing 267 cubic centimetres of Titanium per minute. Nikken Kosakusho developed the X-Treme Milling Chuck as a direct response to the creation of the TiTAN range introduced by Technicut Ltd. During the testing phase for TiTAN it became very apparent that the toolholding solutions available on the market were neither effective nor did they offer the performance and reliability demanded from high-helix cutters and the titanium material. Historically, during heavy cutting when tool loads are increased any cylindrical tool shank gripped inside a cylindrical bore (held captive through friction alone) suffers micro radial movement irrespective of the capabilities of the tool holder system and whatever the gripping forces applied to the tool shank. The end result for the cutter under great load is that it is effectively drawn from the bore by a combination of both the cutting force and the tool's helix / geometry.